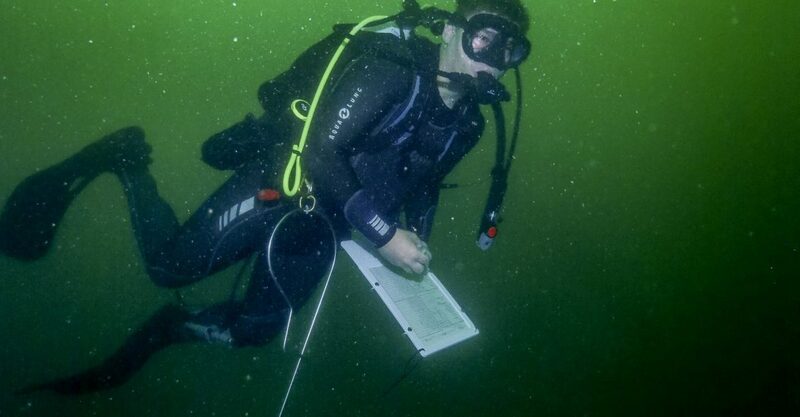 ST. PETERSBURG, FL – As part of a multiyear artificial reef study, divers Jon Peake and Meaghan Faletti finished up our Summer fish surveys this past week. Water clarity can be patchy this time of year but is typically more favorable than other seasons. Unfortunately, red tide conditions throughout the Tampa Bay region this year have influenced water conditions across our survey sites. Red tides, also known as harmful algal blooms, are the result of uncontrolled planktonic algal growth when conditions are just right (e.g. excess nutrients and plenty of sunlight). Blooms produce toxic conditions for local sealife often resulting in fish mortality events. They also alter the light environment throughout the water column (note green hue of many photos) which may affect photosynthetic organisms on the seafloor such as fleshy algae or corals, further impacting marine community dynamics. 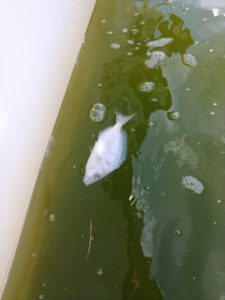 Estimating long term impacts of harmful algal blooms involves complex analyses of marine communities; however, multiyear data sets, such as the study highlighted here or fishery data collected by the Florida Fish and Wildlife Conservation Commission, provide some coarse indications of short-term impacts on local marine communities.